Human Rights, Liberation Struggle and Reconciliation: Nelson Mandela Legacy Sites is part of the Tentative list of South Africa in order to qualify for inclusion in the World Heritage List. I find this nomination lacking any real credit for unique value to the world. Yes, Mandela was a great man, apartheid was bad (and still exists here) and one could argue that it had impact on the world and not just within South Africa. However, just like India's attempt to inscribe the Gandhi sites, these are memories of history that do not belong on the world heritage list. So nevertheless I stopped by the Apartheid museum at the capture site on the way to Durban and their museum is still not open until May 2019. Entrance is free to see the small exhibition and the Mandela sculpture at the end of the Long Walk to Freedom. I didn't find it very exciting but I donated to support them. Fact is that the location has little to nothing to do with the capture site already shows that the inscription would be odd. I see there are many other sites included in the nomination but I am not interested in them, and if they are ever inscribed (to my own disbelief) I will be glad to have “ticked” it off in 20 minutes. Human Rights, Liberation Struggle and Reconciliation: Nelson Mandela Legacy Sites is the full name of a South African Tentative Site covering 13 groups of sites related to the anti-apartheid struggle. They cover locations ranging from the Sharpeville Massacre site to prominent institutions for missionary education which “produced Southern African leaders who presented a synthesis of Western and African values”. It needs a good understanding though of South African history during the past 100 years to get a full grasp of what’s included and why. But I was willing to be educated. As I had another long drive ahead of me – 440km between the WHS of iSimangaliso and Drakensberg – I decided to visit two of these anti-apartheid sites along the way. I first hit the town of Groutville for the ‘Chief Albert Luthuli Home & Museum’. The museum is already signposted from the highway. Fortunately so, as my TomTom navigation did not recognize any street adress in Groutville. The town is definitely not one on the itinerary of European tourists, crossing South Africa from (white) tourist enclave to another. Groutville is 99.6% black. To me it felt like a town in the Deep South of the USA. Before I prepared this trip I had never heard of Albert Luthuli, but he was an important predecessor of Mandela. 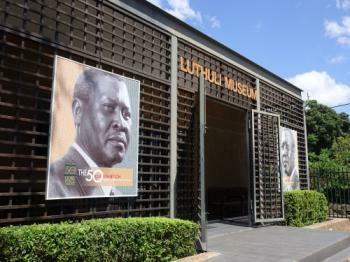 Luthuli was president of the ANC in the 1950s and 1960s, and advocated nonviolent resistance against apartheid. It earned him the Nobel Peace Prize already in 1960. The house where he lived most of his life has become a museum since 2004. After signing in at the gate, I was shown around by a serious young guide. In the garden Luthuli had a special place of contemplation. Here he also received his guests (he was only allowed to see one at a time and forbidden to leave his hometown himself). His most famous guest was Robert F. Kennedy, who arrived in Groutville by helicopter. Within two years of their meeting both men were dead: Kennedy was assassinated, and Luthuli died in a train accident. The guide said that his family however thinks that it was not an accident but a political murder. Driving on along the southeast coast, past Pietermaritzburg, I approached the second location. It’s the ‘Mandela Capture Site’ at Howick. The site isn’t signposted as well around town as the Luthuli Museum, but this time my TomTom did the trick and had it listed under ‘tourist attractions’. This is the location where Mandela was arrested, the arrest which lead to his long imprisonment on Robben Island. He was stopped by the side of the road, while pretending to be the driver of a white businessman. It still is a inconspicuous spot, some 4 km outside of Howick along a secondary road. At this symbolic location a visitor center and memorial monument have been constructed. They’re even in the process of building a grand exhibition hall: this should for example include a replica of Mandela’s cell on Robben Island. A tunnel has to connect the hall with the exact location where the arrest took place across the road near the railway tracks. Even now tourists already know to find this place. Two Dutch tour groups were already present when I arrived, and there were also numerous individual South African visitors. The exhibition now shows dozens of information panels about Mandela's life since he was a child. In the outdoor area a straight path symbolizing the Long Road to Freedom leads to a work of art. 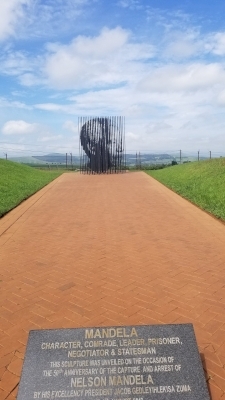 50 jagged steel bars (a reference to prison bars) form the silhouette of Mandela’s face. This TWHS obviously has clear links with the already inscribed Robben Island, although it is not presented as an extension. To add to the confusion there’s an earlier incarnation of this TWHS on South Africa’s Tentative List called ‘Liberation Heritage Route’ (2009), which covers both Robben Island and the Mandela Legacy sites. It seems logical though that South Africa will push on with this 2015 TWHS. Its selection of sites goes well beyond a Mandela personality cult, and brings more depth to the history of the anti-apartheid struggle than Robben Island alone. For now checking out a few of them is a good excuse to get off-the-beaten track in South Africa. Read more from Els Slots here.